The drive Northwards from Ross-shire across the Dornoch firth is where it begins! Travelling through Sutherland Piper on Parade always gets that warm sense of returning home. There are a number of quiet highland villages to negotiate along the way and key landmarks that stand out; Dunrobin Castle, and the “mannie on the hill” above Golspie to name two, before the winding road begins to climb up onto the Ord of Caithness and where there is a subtle change in scenery as the rugged windswept landscape appears in the distance. Once clear of the Berriedale Brays, its stunning sea views all the way to Dunbeath, with its white castle perched on the cliff side. Then onwards to Latheron and inland across the flow country to Thurso nestling on the North coast, the most northerly town on the British mainland. 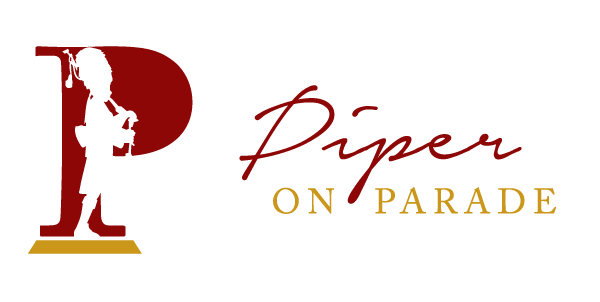 Now, Piper on Parade likes to be prepared and to arrive in plenty of time, and having found the West Church and the Park Hotel, (stumbled across the hotel as I arrived) It was time to relax and open the coffee flask. Being suitably refreshed Piper on Parade headed off to the church, where following a quick meet with the nervous groom tuned up in readiness for the guests to arrive. It wasn’t long before there was a steady stream in all their finery making their way up the church steps. The Piper gave renditions of The Braes of Killiecrankie, The Rose of Ananndale and Wings, amongst others to help them along. It was a somewhat blustery day, playing havoc with the feather bonnet, tartan ribbons and tassels, but the rain was holding back, which suited the Highland piper just fine. Now, the following doesn’t happen very often, in fact Piper on Parade can’t ever recall it happening in his experience, and it may never happen again, so it is worth mentioning, but believe it or not the bride arrived 15 minutes early!!!!!! Yes, you heard right…. This resulted in a wait as the choir had a number of pieces to perform prior to the ceremony. It was great fun to witness the bride and the bridal party dance along to the singing in the church vestibule, before eventually getting the nod that the next number was their Q to glide up the aisle. Following the service Piper on Parade piped the happy couple out into the sunshine and then made a dash to the hotel to pipe their arrival. This couple knew what they were on, no long list of photos to be endured here, within 40 minutes the piper was playing them to the top table to be greeted by their cheering guests. This was a wedding that wasn’t hanging around! Isn’t Caithness just the place to play the pipes.